A rainbow of bouquets all ready for the Garden Party are the results of days’ worth of work for Cathy Tyler and her talented volunteers. Cathy Tyler has a sweet job. 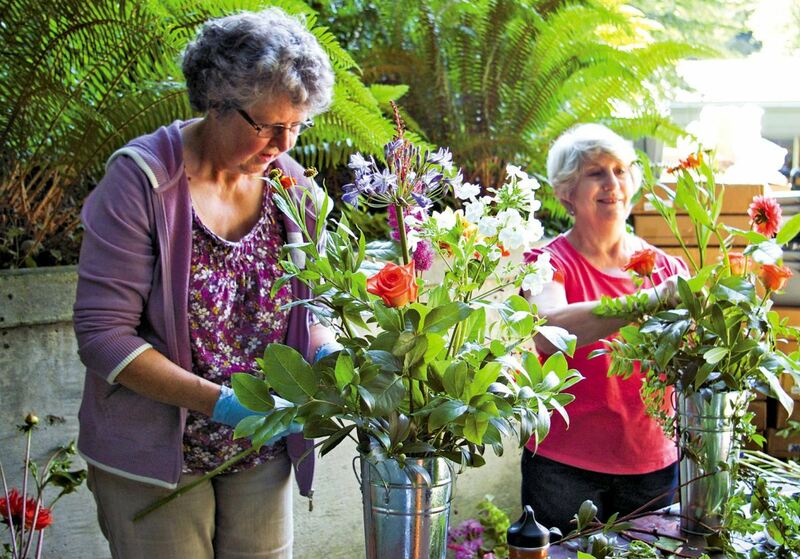 She’s the florist for the Bloedel Reserve and with the assistance of volunteers, creates fresh arrangements for the visitors center, tends the cutting gardens and checks the existing bouquets to make sure they are still looking new. 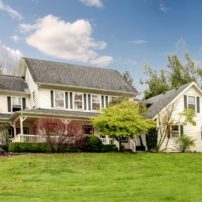 The French-country-styled house that was the Bloedel family residence is now the visitors center and focal point of this amazing public garden and forest preserve. 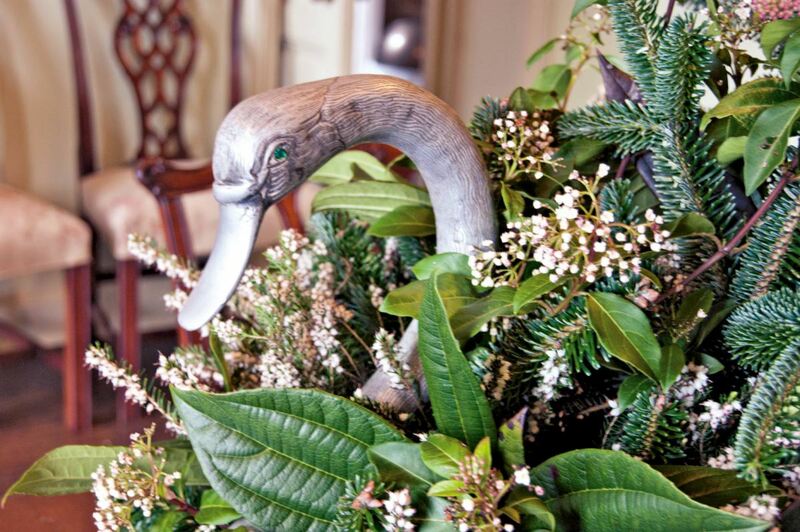 Tyler is responsible for making the house welcoming, fragrant and seasonally cheerful. 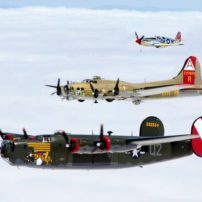 Besides decorating the house and main entry with gorgeous holiday boughs, a major task is to make the annual summer Garden Party fundraiser a floriferous splash. Year round, the botanical garden serves as a handy florist case for splendid bouquets and Tyler gets to decide their weekly composition. 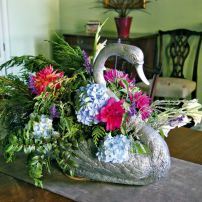 An elegant summertime display features fragrant oriental lilies, zinnias, salal, heather and cedar. 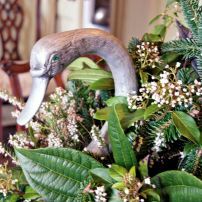 Visitors will discover many great ideas for cutting from their own gardens by simply observing the seasonal displays. 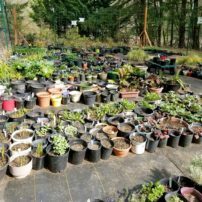 While they often consist of exotic touches due to the reserve’s broad palette of trees, shrubs, perennials and bulbs, they also feature a backbone of lovely native plants that many gardeners already have growing wildly on their plots. 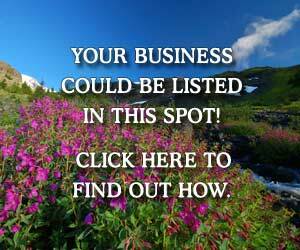 Tyler also teaches floral workshops in the fall. 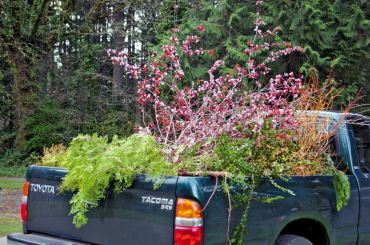 With the help of the reserve’s arborists Ken Little and Diann Eckler, as well as other horticulture staff, Tyler often arrives at work to stacks of branches otherwise destined for the compost pile. 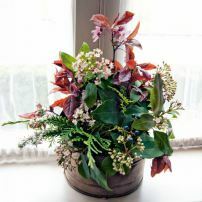 Everyone at the reserve knows that Tuesday is floral day and anything interesting might be useful for the 12 or so arrangements custom-made weekly. 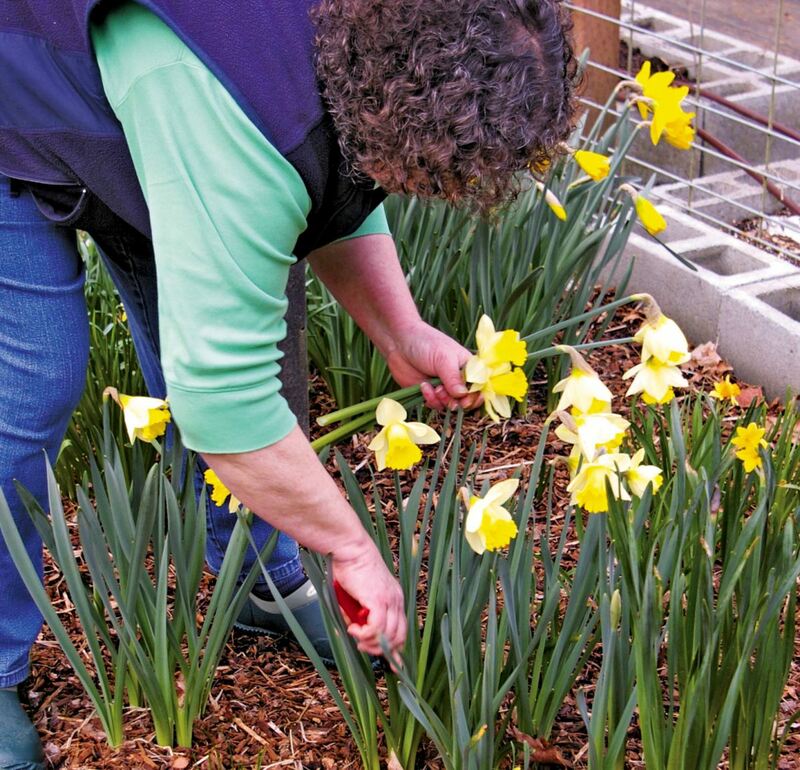 Cathy Tyler cuts daffodils from a patch in front of the cutting garden. She holds up pine branches with long, silky needles from a neighbor’s weekend yard work. 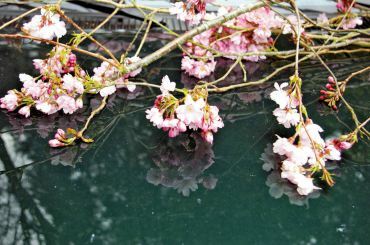 “I start the arranging process each week from my truck,” she says, demonstrating by laying out cherry blossom studded twigs on the hood. 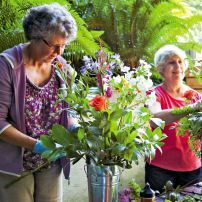 Tyler had met Jan Long, the previous florist at the reserve, at the Hansville garden club Flotsam and Jetsam and started volunteering with her at Bloedel. 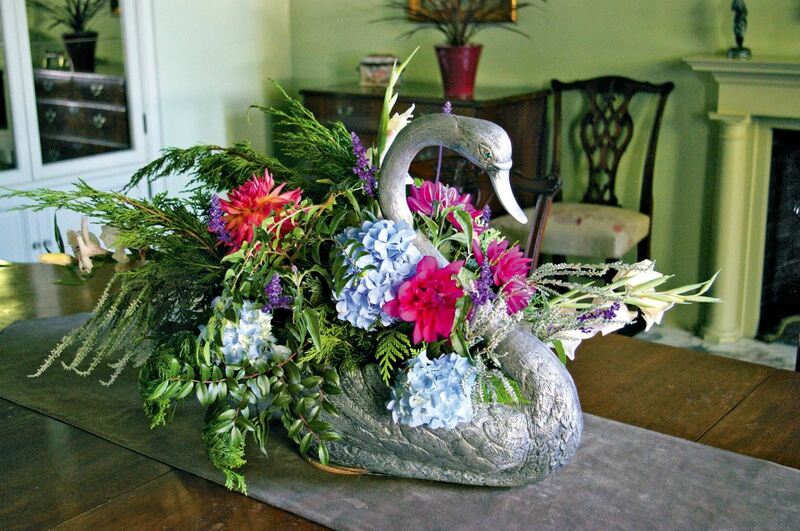 Tyler’s formal florist training from years before in Denver again came to life. 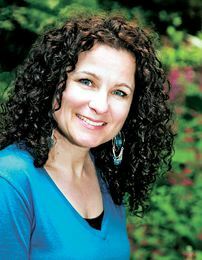 After a career in accounting, she was ready to get back into bouquets and took over for Long when she retired five years ago. 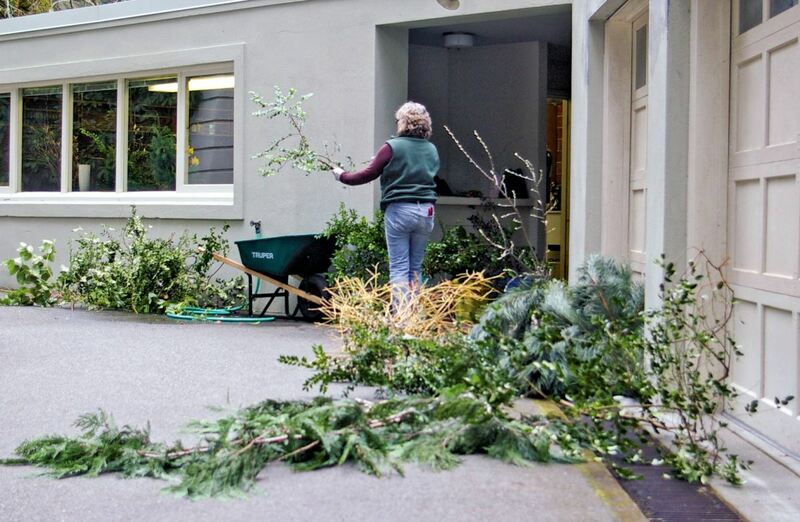 Volunteer Deb Damron organizes cuttings from a wide variety of choice trees and shrubs on an early spring Tuesday. “I walk the gardens to see what’s coming on, and the gardeners will also tip me off to unusual things that are looking good,” Tyler says. 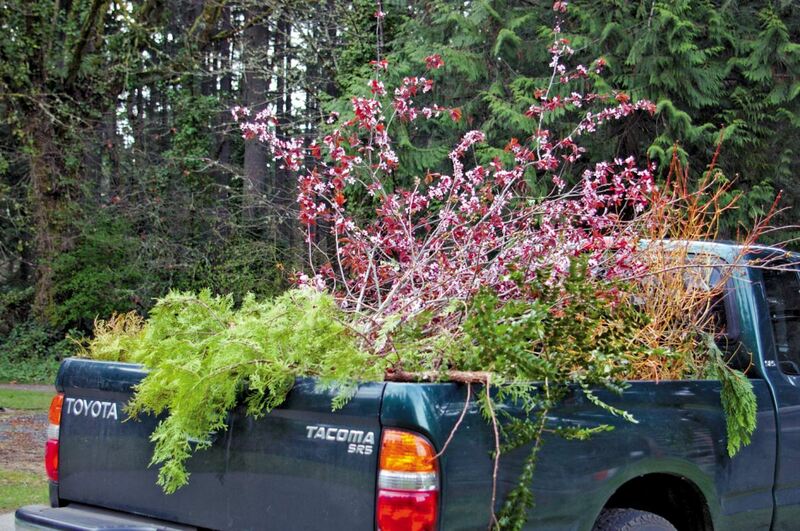 Tyler’s pickup loaded with cuttings set aside for her by Bloedel’s arborists. 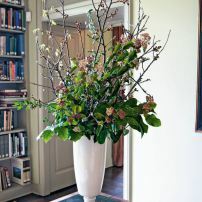 Andy Navage, director of horticulture, often brings her flowering orchids from the greenhouse to dress up for the house. 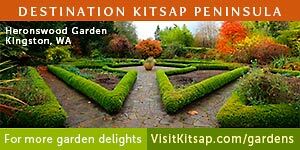 They both mention how lucky they are to work in the lush and inspirational setting of an internationally known botanical garden. Gardeners who make arrangements from their own yards can learn from this technique, as well as from the idea that if they’re doing their seasonal pruning or removing an overgrown or diseased plant, it’s an opportunity to savor it in indoors. “Last year, an old and diseased cherry was removed from the Japanese garden,” says Taylor, adding that while they were “all sad to see it go,” she used the branches heavily in arrangements for a final sendoff. Once Tyler has piles of newly collected plant material at the garage of the house, the next step in the day is to wash and condition the materials. Different plants and flowers require specific handling. The delicate flowers like bulbs generally go right into containers of cold water. 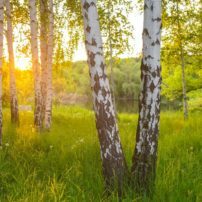 Woody materials such as evergreen branches get washed in a wheelbarrow full of hot water, then the stems are sunk into buckets of 2 to 3 inches of hot water for 20 minutes where they hydrate rapidly. 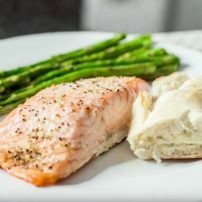 Luke-warm water is added and they sit for up to an hour; this conditioning plumps them up to last for a week or more. 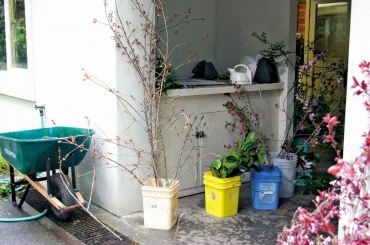 Tools of the trade: a wheelbarrow filled with hot water, an electric tea kettle and freshly cut greens and flowering branches. 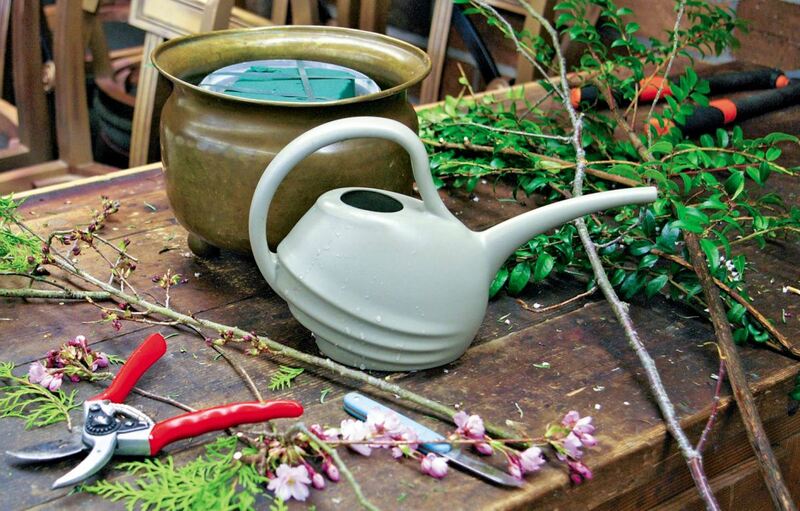 Who knew an electric teakettle could be such an indispensable floral tool? Perennials, depending on the thickness of their stems and the extent that the flowers are open, can be plunked in hot or cool water — Tyler continues to experiment to see what methods get the longest vase life. Once the stems are conditioned, it’s time to assess what they have to work with. 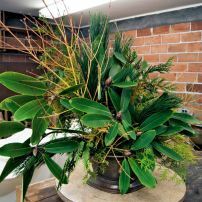 This includes evergreens and other stems conditioned in previous weeks and tucked by the bucketful in the walk-in cooler. 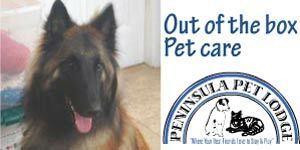 According to Tyler, greens in winter can last up to three months when stored outside. 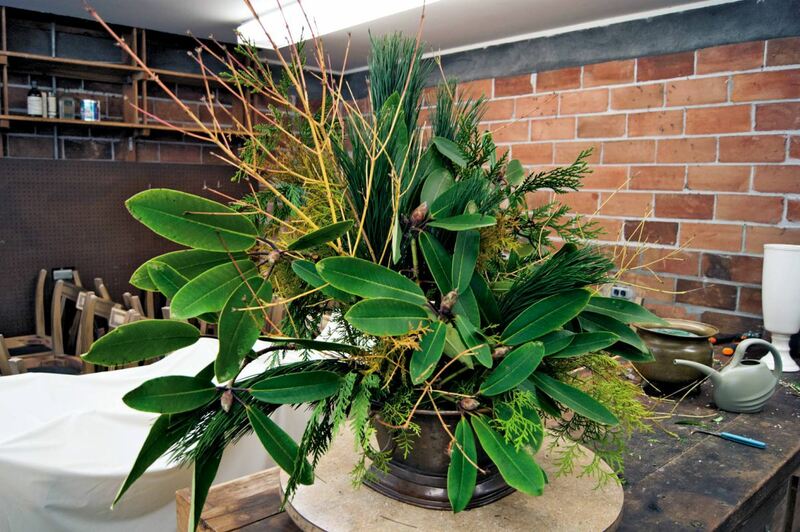 Noble fir and other conifers can last months and have an especially long vase life. Tyler with a summer arrangement in the library featuring salal, zinnia, dahlia, Penstemon, Mahonia, oriental lilies and Hydrangea. 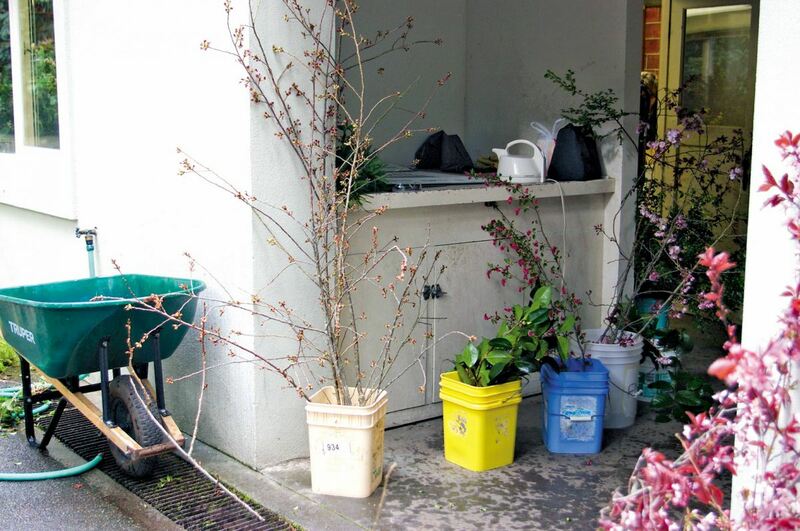 “I try not to cut greens in the botanical garden every week — just a sample of the ‘pretties,'” Tyler says as she designates a bucket of salal as tired and ready for the compost bin. She then goes on to collect standout components for the largest, most focal of the arrangements, which she usually tackles while the volunteers create the multitude of smaller bouquets. 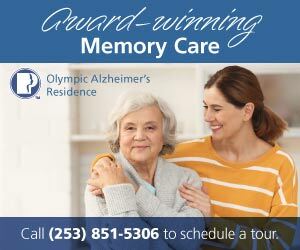 During the lead up to the Garden Party event, Tyler and half a dozen volunteers make the arrangements that go on each guest, banquet and beverage table, in addition to the usual house displays. It is at this time of the year that the cutting garden comes most in handy. 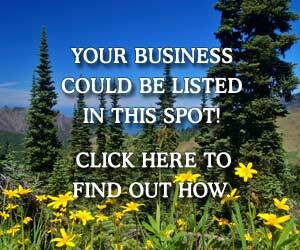 Roses, peonies, lilies, to name a few, are corralled in a full-sun, fenced area to protect from deer and rabbits. 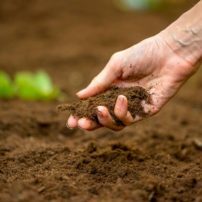 Inside are rows of raised beds filled with the rich soil that nurtures annuals, perennials, bulbs and small shrubs and an area planted with broader spreading beauties like weigela and lilac. The hallway table features a lush midsummer display of Hydrangea, two cultivars of Crocrosmia, hardy gladiolas, Mahonia, salal, and cedar. 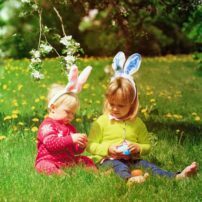 Since the cutting garden alone cannot supply the needs for the Garden Party, additional flowers are purchased from local suppliers. Tyler selects dahlias, roses and whatever is fresh and alluring to supplement what is grown on site. 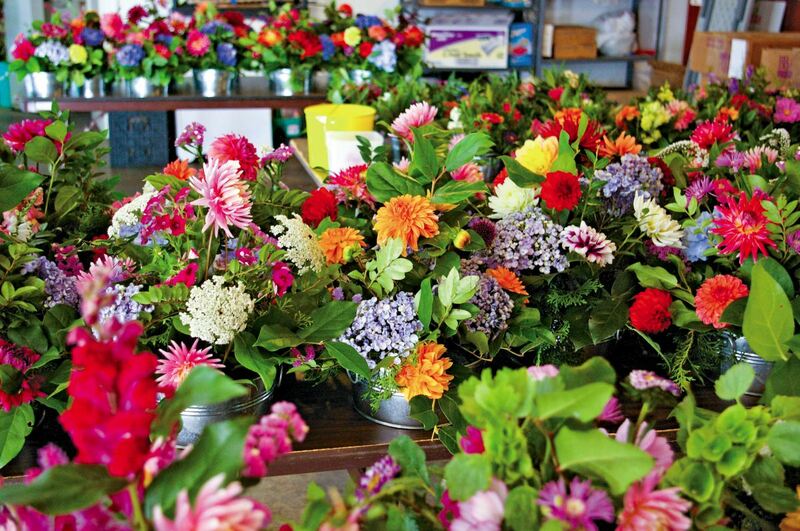 Then, she and her crew begin fashioning a rainbow of bouquets, in an almost assembly-line fashion. Each is unique and seemingly more stunning than the previous. 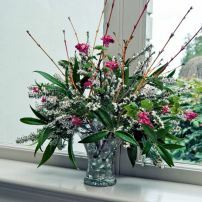 The air is heavily perfumed and tables quickly fill with arrangements in matching containers, the style of which is different every year. 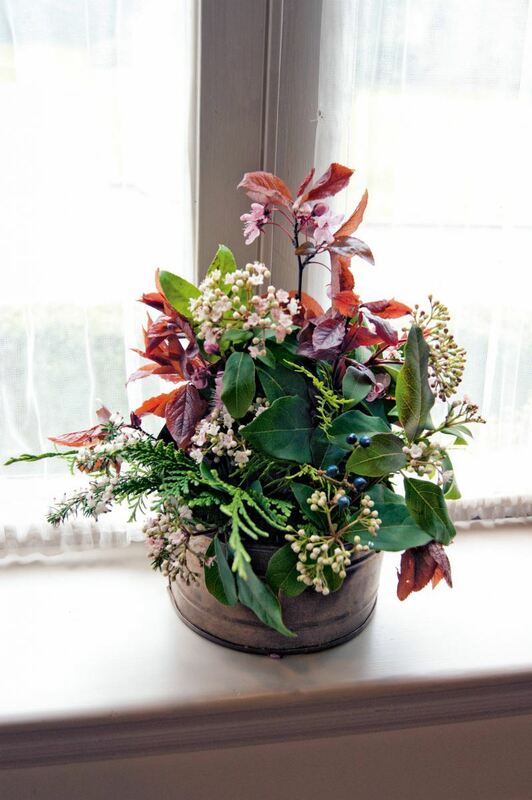 Last year’s bouquets were held in galvanized buckets with an informal, country charm. 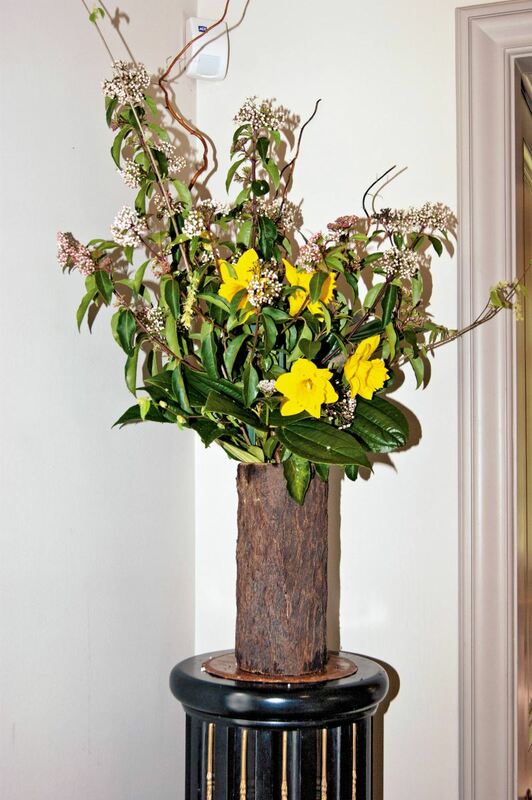 When it comes to creating each arrangement, pruners are used to cut up to 2 inches off the base of woody stems in half, long ways and to a point. The thicker bark is sliced off with a floral knife on the base for more water uptake. Tyler uses a hammer to crush some stem ends, such as lilac, so that they absorb more. While many florists add various concoctions of “flower food” to the vase water, she prefers plain water, changing it twice a week. 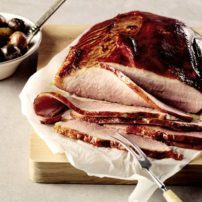 An exception, she says, is during the holidays, when the backbone of some arrangements lasts for weeks. “That’s when I use a tablespoon of alcohol in the water to keep down the algae,” Tyler says. 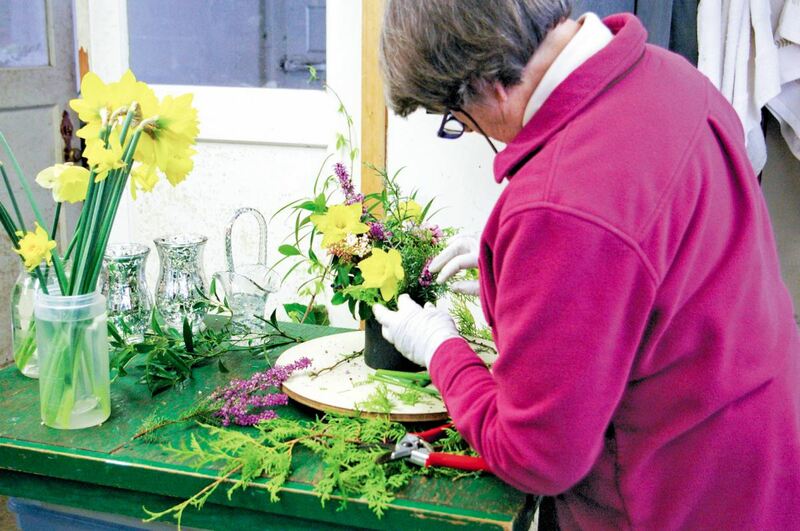 Volunteer Chrilo von Gontard uses a lazy susan to create balanced bouquets with bright daffodils and heath. Watching Tyler and volunteers work on arrangements reveals that each person has a different approach to the process. 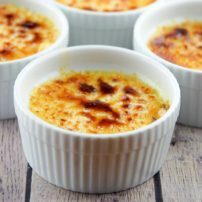 In fact, she varies her method depending on the style of container she’s using. 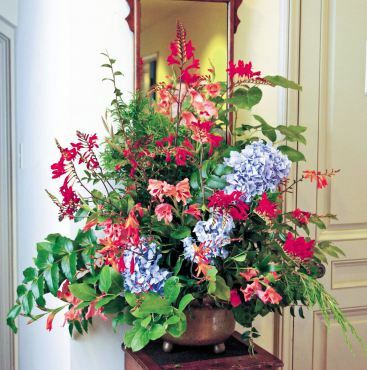 For tall vases, she starts with the main, showy floral component first, then fills with greens. 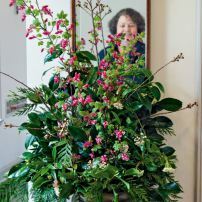 For lower, fuller arrangements, she starts with the greens first, noting that she likes to use at least three different textures of greens in every arrangement for variety and contrast. For tulips, include three to five pennies in the bottom of any arrangement using tulips to keep them from drooping. 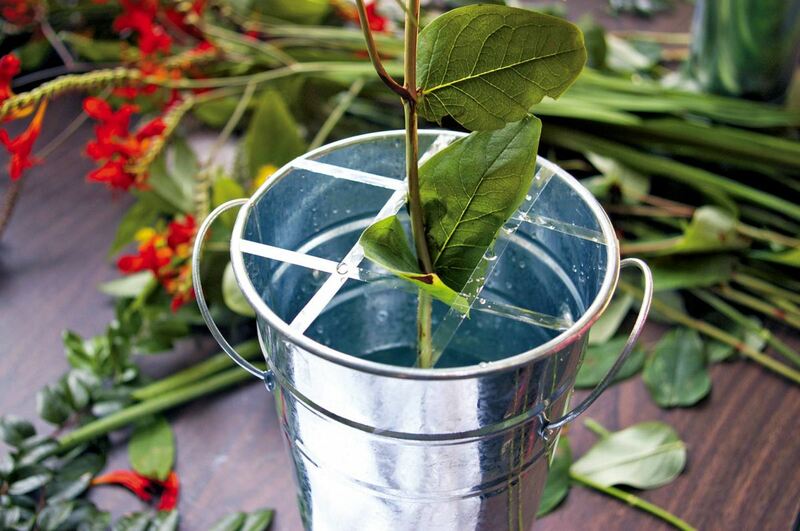 A grid made of clear, waterproof tape will keep stems upright and positioned correctly. 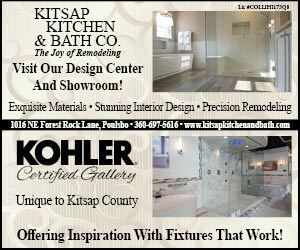 Add and remove glass marbles carefully to avoid breaking vases. 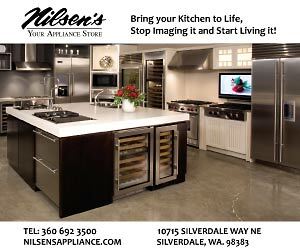 When using evergreens like salal, avoid stems with new growth, as they will wilt in a vase, even when stems are well conditioned. 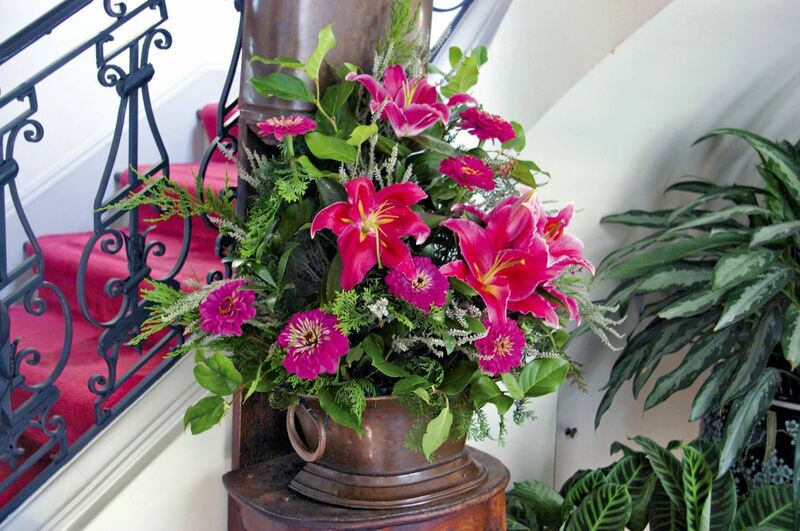 Think about what angles a bouquet is viewed from and make those areas full. She applies a few overarching guidelines yet still values the improvisational nature of floral arranging. 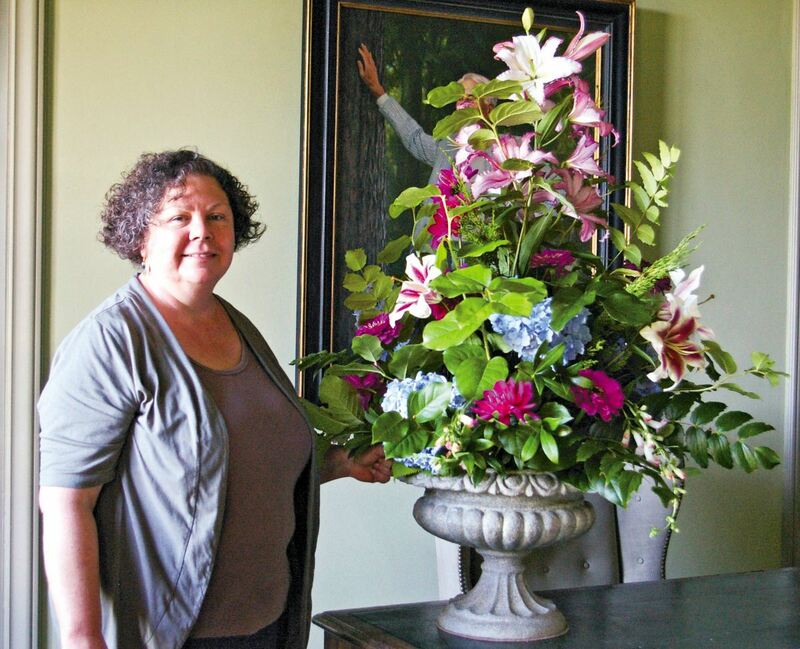 She demonstrates these tips in her floral workshops, which she refers to as “play days” since all those in attendance enjoy themselves and take home a bouquet. 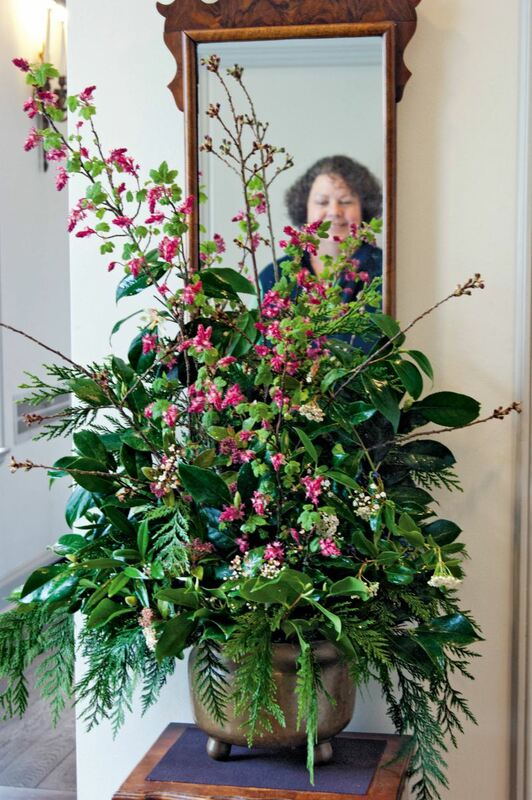 Tyler is reflected in the mirror in the hallway of the visitor’s center and in the late winter floral design she created with cedar, Viburnum, Camellia, Sarcococca, cherry and flowering currant. Maryann Malabon and Ernestine Schwartzman enjoy the fresh air and the creative spirit that surrounds preparations for the Garden Party. 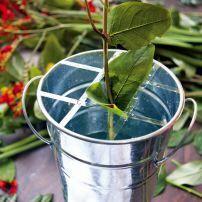 Transparent tape is used to make a supportive but inconspicuous grid to support flower stems and keep them in place. Tyler likes to use at least three different textures of greens as a backdrop to her bouquets. This early spring arrangement starts out with pine, rhododendron and cedar. Lucy’s dressed differently in every season. 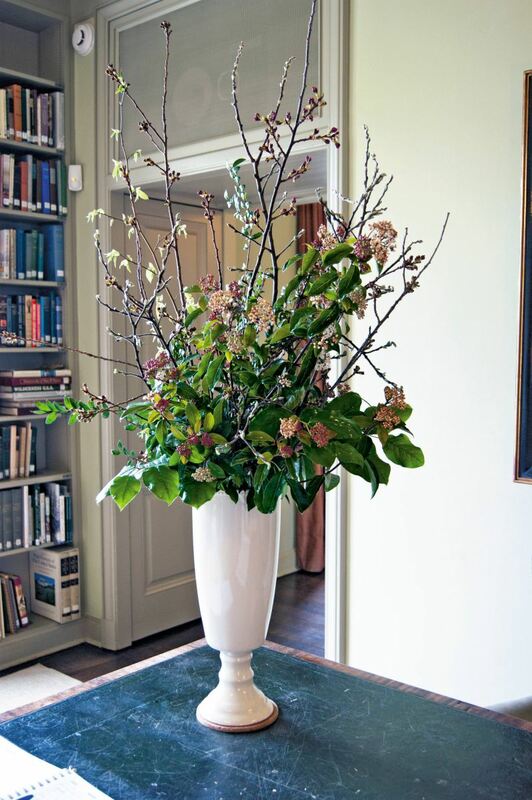 A tall, stately arrangement on the writing desk of Prentice Bloedel features Corylopsis, huckleberry, cherry, maple and Viburnum tinus. 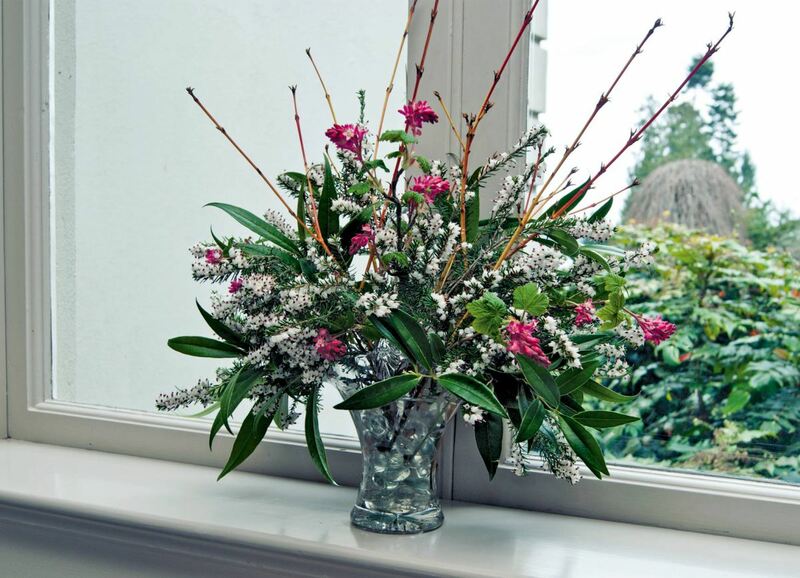 A late winter combination of white heath flowers, red flowering currant, Sarcococca and yellow-twig dogwood combine well in a small glass vase.